Kanawha County Schools Superintendent Ron Duerring said Wednesday to a packed crowd that Herbert Hoover High School near Clendenin would not reopen following the late-June floods that severely damaged the building. Duerring’s plan is to build a new school with funding from FEMA. CHARLESTON, W.Va. — Before a crowd of more than 600 people crammed into the Elkview Middle School auditorium, with every seat full and people standing in the entryways and in aisles, Kanawha County Schools Superintendent Ron Duerring announced Wednesday evening that the Herbert Hoover High School building won’t ever reopen, but that the area will get a new school. 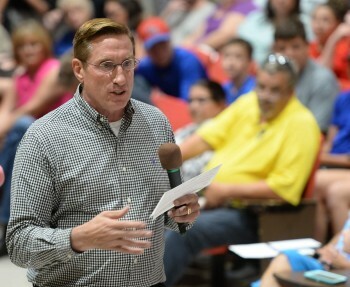 “We cannot reopen Herbert Hoover, we can’t, and I know that’s tough on the community, but what’s going to come out of it is a brand new Herbert Hoover High School that will be in the Herbert Hoover area,” Duerring said, drawing applause from the crowd, whose cars filled the Elkview Middle parking lot and lined Elk River Road in front of the school.